These Southeast Asian plants have flowers of heavy substance, lasting from one to three months. There are multi-flowered, sequential flowered and single flowered varieties of many different sizes, shapes and colors. To this day there is no accurate way to clone Paphiopedilums, making mass production difficult. 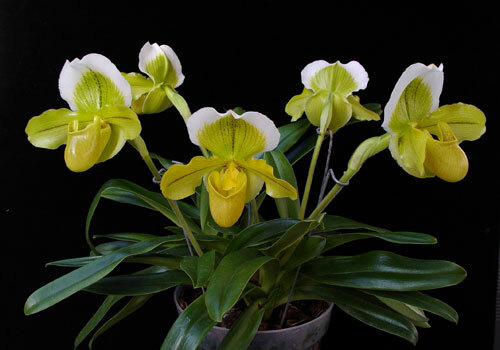 Therefore the Paphiopedilum is one of the most unique and popularly collected orchids in the world. Many varieties can be grown easily indoors. Paphiopedilums do well in a diminished light. An east or west window (providing 1000 to 1500 foot-candles of light) is ideal. The east exposure is better because the temperature is lower in the early part of the day when the plant is receiving the greatest amount of light. A south window is acceptable as long as the sunlight is filtered so as not to burn the plant. Paphs also do very well under artificial lights, such as fluorescent (grow at 10-19" from tubes) or L.E.D. Grow Lights. Run the lights according to the seasons: 11 hours in winter, 14-16 hours in summer. Strap-leafed, multi-flowered species or hybrids can take stronger light up to 2500 foot-candles. There are both warm and cool growing Paphs. Generally speaking, those with mottled foliage and the strap-leafed, multi-flowered species or hybrids do best in intermediate to warm conditions, preferring daytime temperatures of 70-80 degrees F. and nighttime temperatures of 55-64 degrees. The cool-growing species are mostly from India and grow at higher elevations. Complex hybrids are cool growing and bloom mostly during the winter season. These types prefer nighttime temperatures of 55-62 degrees with days around 65-70 degrees. They will all tolerate the heat of summer as long as they are regularly watered, shaded and kept in humid conditions. The mottled leafed varieties do best in a warmer house or apartment and can often bloom twice a year. Like all orchids, it is important to water in the morning. This insures complete water evaporation on the foliage as well as the crown by nightfall, thus preventing bacteria and fungus rot. Water the plant as it approaches dryness. Use rainwater, distilled water, reverse osmosis water or municipal water. Do not use softened water. Put plant in sink when watering and allow it to drain well. Under most growing conditions, watering is done at 3-7 day intervals depending on the pot size. Important: PLANTS SHOULD NEVER STAND IN WATER! We highly recommend Green Jungle Orchid Food, especially formulated to work with rain, distilled, reverse osmosis water or water low in alkalinity. Fertilize with Green Jungle every time you water, all year round. This is the fertilizer that we developed and use on our own plants. The results have been excellent.For tap or well water, during spring and summer we recommend a 1/2 tsp. per gallon solution of GrowMore 20-10-20 fertilizer every other watering. During fall and winter, this should be reduced to every third watering. When using rain, distilled or reverse osmosis water, add back 5-10% of your hard water to provide necessary calcium and magnesium. Paphs like a humidity of between 45% and 70%. This may be accomplished by the use of humidifiers or by filling a saucer with crushed rock and placing it under the plants. The water under the rock will slowly evaporate, slightly raising the humidity level. Make sure that the pot rests above the water level in the saucer. Our humidity trays are another option you can use to place your plants on. Potting material is usually ready for replacement once every year to year and a half. The best time for repotting is the spring or early summer or fall when temperatures are mild. Use a medium grade orchid bark mix for plants in 3.25'' pots or larger, and a small mix for plants in smaller pots. Large plants with 6 or more growths can be divided. Pot with oldest growth closest to the rim of the pot allowing room for 1-2 years growth. Most growers find that plastic pots work best for Paphiopedilums.